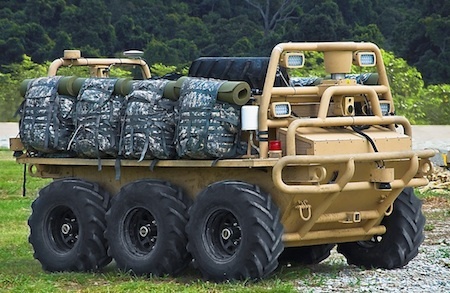 Lockheed Martin’s Squad Mission Support System can carry up to six hundred pounds of gear for soldiers. It is being tested at White Sands Missile Range in New Mexico. It uses ladar, or laser radar, to identify the unit it needs to follow and drives off autonomously behind. John Varley, writing in his 1976 story In the Bowl, wrote about a vehicle he called a "tagalong:"